An intereresting case came in on April 4th (2002) which provided a learning experience for both me and one of our staff members. Tigger is a young male cat that seems to have wandered someplace that he was unwanted. In this view you can see that the front leg has been shattered by a bullet. I explained to the owner the many problems associated with treating this fracture. We recommended a surgical procedure that we felt would provide the best chance of recovery. The biggest obstacle that the owner saw for this procedure was that he had been out of work for a long time with injuries that he himself had experienced. We know how hard this type of problem can be. However, we also have financial limitations and applying the device that we wanted to use costs quite a bit for us as well. 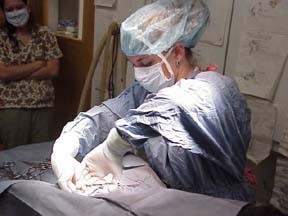 When I was in college working for veterinarians in Missouri my employers often allowed me to "scrub in" for procedures and I consider that some of the most valuable education. This type of experience allowed me to have a much better idea what was most critical to concentrate on while I was in veterinary school. I had the chance to see what things actually "felt like" so when my "turn" came so I was not overwhelmed by new experiences. 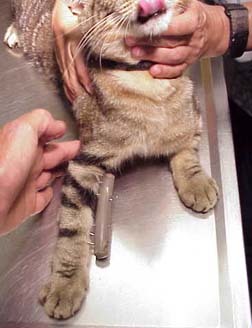 In this particular case the owner indicated that the cost of the procedure was more than he could afford and he made the tough decision that euthanasia was his best option. We offered an alternative in this case. We had the time to offer the option that this case be used as a training case for one of our employees that will one day become a fine veterinarian. We explained to the owner that a student that is not a veterinarian would be allowed to perform part of the procedure under my direct supervision and that we would use a technique that reduces the cost to our hospital. With he permission we applied an external fixature using an acrylic substance "infused" into a plastic mold to hold the pins in place. This is one of the "post op" radiographs of the fracture repair. While there are things that I could complain about about the repair there are also a lot of great things going on here. This is the second view of the repair and I like this one pretty well also. We were pleased to see Tiger walking on the leg before the night was over and are proud of the work that Summer Austin did on this case. If Summer doesn't turn out to be a much better veterinarian than I am before her time is through then I haven't done my job. She has the "smarts" and the technical skills to very good. Time and continued education will will tell what she is capable of. Summer at work. Study, study, study! "It don't come easy", "chemistry is important" and "don"t make the mistakes I made"!! We saw Tigger on 4-19 and things looked good. Tigger is using the leg and it appears that the infection associated with the nasty bullet wound is getting under control. We can feel parts of the bullet under the skin now that the swelling is down. We hope that we will be able to removed them at some point soon. On 6-7-02 we removed the last of the plastic and pins from the leg and healing seems to have progressed very well. He is walking on the leg. We have advised the owners to keep Tigger restricted in activity for a few weeks until the bones have reached better strength.